Clear eyes, full skirts, can't lose! 1. A long-sleeve midi in print that'll say, "Florals? For fall? Groundbreaking." PSST! It also has POCKETS! Get it from Amazon for $19.99+ (available in sizes S–XXL and six colors). 2. 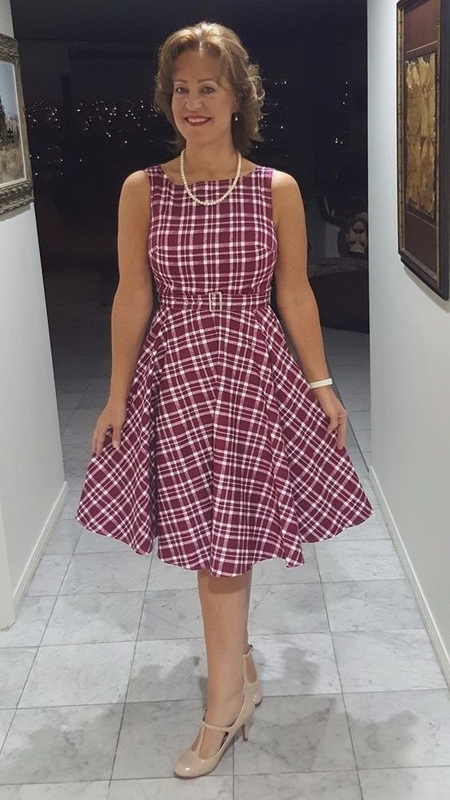 A full-skirted plaid dress perfect for going on woodsy fall strolls or wearing to holiday parties. Get it from Amazon for $15.88+ (available in sizes S–XXL and 21 colors and patterns). Promising review: "I don't know if I have ever been this in LOVE with a dress! The dress was perfectly comfortable in the bust and armpit areas, allowing for complete range of motion, and fell right below my knees. 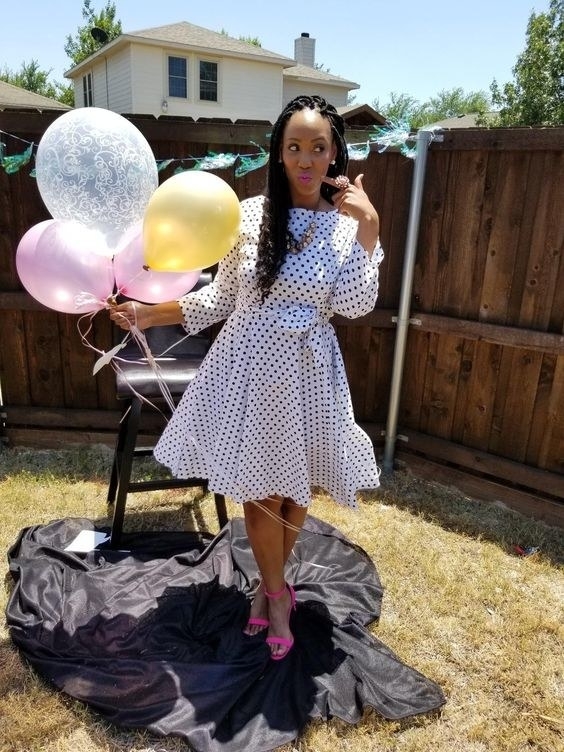 I purchased this dress for a garden party and it literally turned heads everywhere I went! I don't know that I have ever been so complimented or admired for an outfit ever before! Hands down, this is among the BEST purchases I have made on Amazon! 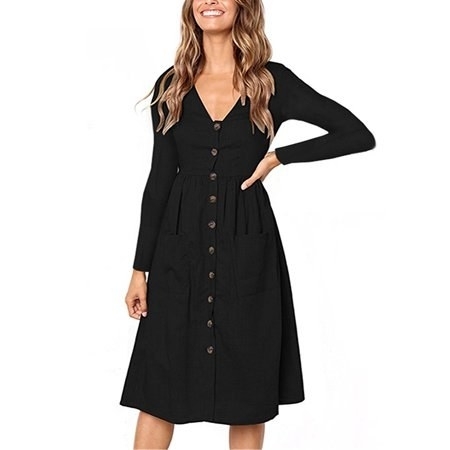 You can't beat the price and the fabric is wonderful, comfortable, and has a little stretch to it, which is always nice. I would give this dress 10 stars if I could!" —Lauren S.
3. A strapless stunner with an all-over fringe to make your (already excellent) dance moves look even better. Get it from Eloquii for $199 (available in sizes 14–28). 4. 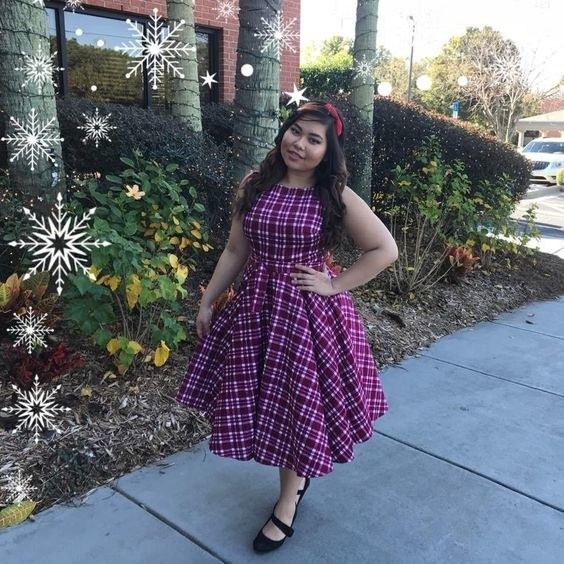 A v-neck rockabilly dress you can layer with a poofy petticoat for the ultimate in dance wear. Get it from Amazon for $25.99+ (available in sizes S–3X and 20 colors and styles). Get the perfect petticoat to go with it from Amazon for $8.69+ (available in sizes S–4X and 16 colors). 5. An off-the-shoulder number with all-over lace so every day can feel like a garden party. This gorgeous number has over 1,700 five-star reviews on Amazon! Get it from Amazon for $19.99+ (available in XS–XXL and seven colors and in a long-sleeve version). 6. A gorgeous beaded dress inspired by the 1920s. You just need to choose between the Charleston, Jitterbug, or Lindyhop. Get it from Amazon for $29.99+ (available in sizes S–XL and eight colors). Get it from Amazon for $22.99+ (available in sizes S–XL and in black and white). One of our editors loves this dress! Check out her review (and excerpts from the NoLa she wore it on) for all the deets. 8. A pleated trapeze dress in, like, the prettiest red there ever was. 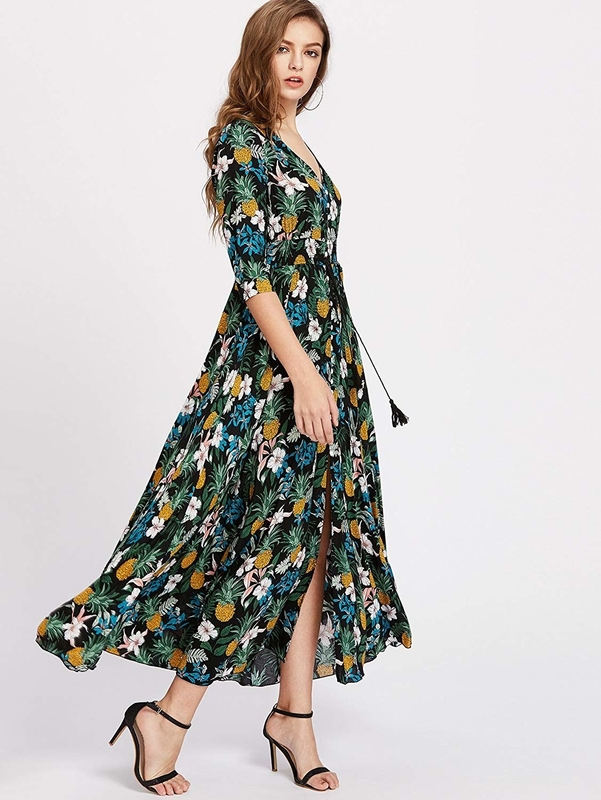 Get it from Asos for $51 (available in sizes 2–12). 9. A cocktail midi with sheer lace and an open back so you can stun from 360°. Get it from Amazon for $25.99+ (available in sizes S–3X and seven colors). 10. A sheer and flowy wrap dress to add a little sparkle to your life — good luck not wearing this to every occasion you have. 11. A button-up maxi with a slit up the front that's equal parts boho casual and teatime elegant. Get it from Amazon for $18.99+ (available in sizes XS–XXL and 36 different patterns). 12. A ruffled LBD designed in a comfy double-knit fabric. You could say that it's guaranteed to ~frill~ you. Get it from Target for $13.49 (originally $29.98; available in XS–XXL and in black [pictured] and a stripe pattern). 13. 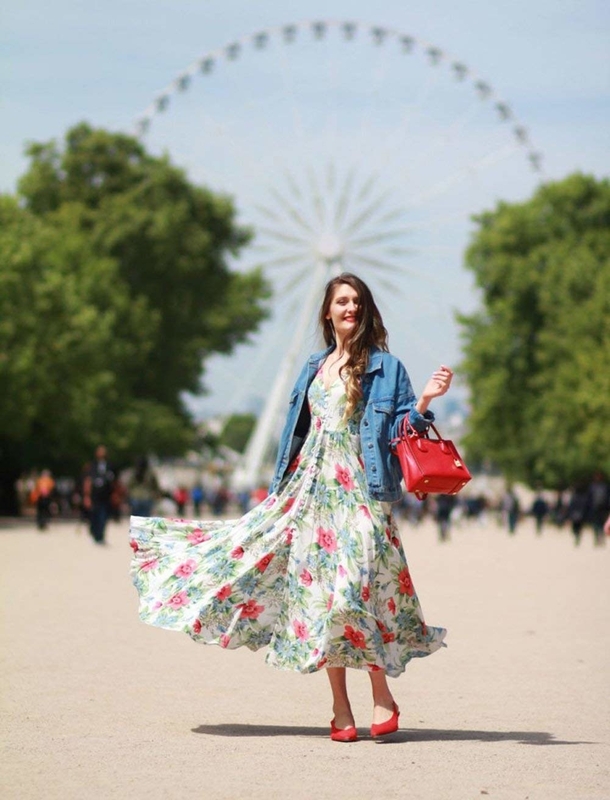 A flowy midi dress that'll tie together in the back for a custom fit around your shoulders. Get it from Amazon for $19.99+ (available in sizes XS–L). 14. An open-back mini in an adorable star print you just have to have in your closet — you and this dress? You're cosmically destined to be together. Get it from Nasty Gal for $25 (originally $50; available in sizes 0–8). 15. A sheer dress with embroidered flowers to add just the right amount of breezy movement (P.S. the slip comes with it!). Reviewers note that it runs small, so check the measurements before ordering! Get it from Amazon for $39.99 (available in sizes S–5X). 16. A long-sleeve t-shirt style so ridiculously comfortable, you'll ~flounce~ around everywhere in it. Note that this one runs a bit big/oversized! Get it from Amazon for $5.99+ (available in sizes XS–L and three colors). 17. A 3/4-sleeve trapeze dress available in 17 different patterns, so you have to get one for every possible occasion. Get it from Amazon for $9.99+ (available in sizes S–3XL and 17 patterns). 18. An off-the-shoulder midi in a sweet polkadot print for major Brigitte Bardot vibes well into the fall. Just add booties and a leather jacket! Get it from Boohoo for $20 (originally $40; available in sizes 12–20 and three colors). 19. A swing dress that'll nip in at the waist with a removable sash belt. Still have *more* weddings to go to this fall? This dress'll be perfect for dancing all night! Get it from Amazon for $18.99+ (available in sizes XS–XXL and 11 colors and patterns). 20. A champagne-colored velvet wrap dress for anyone who has impatiently spent the whole months of August and September waiting for fall weather. Because twirling is way better when you're doing it on crunchy leaves! Get it from Torrid for $48.67 (originally $64.90; available in sizes M–6X). 21. A minimalist grid-print dress that'll give you a maximalist twirl. Get it from Amazon for $20.99 (available in sizes S–XL and three colors). 22. A rhinestone-bedecked mesh skater dress for the perfect combination of drama and sparkle. Get it from Forever 21 for $38 (available in sizes S–L). 23. 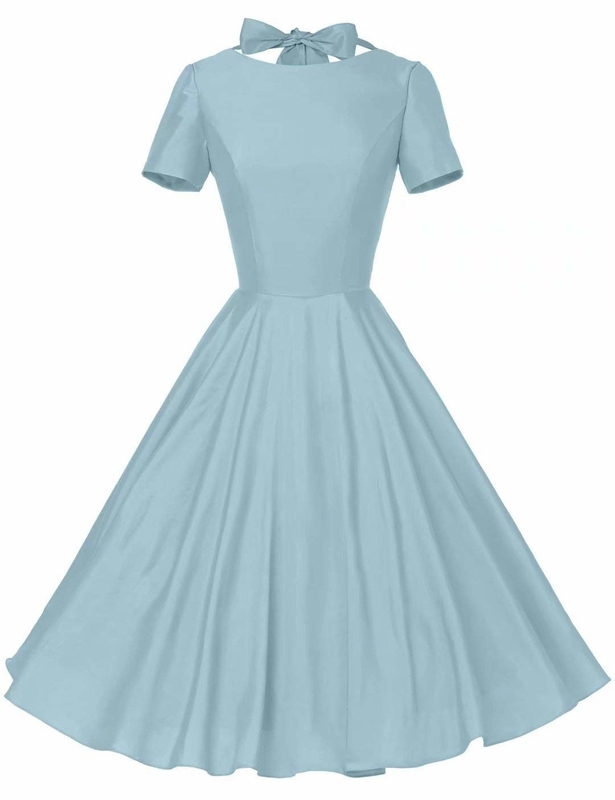 A full-skirted party dress with a scalloped neckline straight from the 1950s. Get it from Amazon for $24.99+ (available in sizes S–XXL and 13 colors and styles, both with short and long sleeves). 24. A belted, knee-length LBD for anyone pleading for pleats. Get it from H&M for $39.99 (available in sizes XS–L). 25. 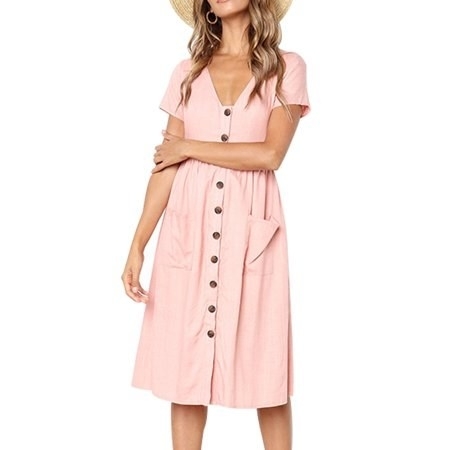 A retro-inspired swing dress with a scoop back and bow detailing to ~tie~ together the perfect outfit. Get it from Amazon for $29.98+ (available in sizes XS–XXL and seven colors). 26. A button-down midi you can wear now with flats or layered with a chunky cardigan, tights, and boots all winter. Plus, it has those cute patch pockets! Get it from Walmart for $16.99 (available in sizes S–XL and seven colors; also available in a long-sleeve version in three colors). 27. A lace-up, v-neck floral mini with bell sleeves and a relaxed fit so you can stay cute and oh-so comfortable. Get it from Amazon for $19.99+ (available in sizes S–XXL and six colors and patterns).